SCOTTS VALLEY, Calif. - April 5, 2011 - Seagate (NASDAQ:STX) today announced the availability of its new GoFlex® Slim portable hard drive — a svelte, 9mm, 2.5-inch external drive designed for the latest trend of portable, thin, stylish laptops and netbooks. Initially showcased at the 2011 International Consumer Electronics show in January of this year, the new GoFlex Slim performance drive is now available on www.seagate.com, in-store and at select online retailers. A 320GB version of the GoFlex Slim drive can be purchased for a manufacturer's suggested retail price of £79,99. At an ultra-sleek 9mm-38 percent leaner than the current GoFlex ultra-portable drives-the new GoFlex Slim drive is roughly the width of a pencil. Sliding effortlessly into a pocket, purse or messenger bag, the GoFlex Slim portable drive enables transport, access and enjoyment of personal digital content from anywhere, making it the perfect complement to today's mobile lifestyle. Equipped with a 7200RPM drive and a USB3.0 interface to accelerate transfer speeds up to 10x faster than USB2.0, this attractive super-slim drive delivers quick access to large, multi-media files such as HD movies and video games. The faster drive speed takes full advantage of the included plug-and-play USB 3.0 interface, while still maintaining compatibility with USB 2.0 ports. 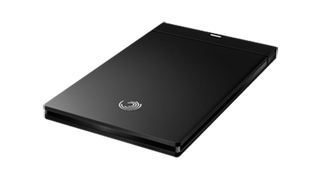 The GoFlex Slim portable drive also allows for use between Windows and Mac® computers, interchangeably, without formatting or performance loss. Additionally, the drive's included premium backup software provides automatic and continuous backups and encrypts files and folders. "The continued growth of personal digital media stores, our increasingly mobile lifestyles and the continued proliferation of mobile devices are driving the demand for slimmer, more portable storage solutions," said Patrick Connolly, vice president and general manager of Retail at Seagate. "Netbooks and slim laptops are great for consuming media, but are limited when it comes to creating and storing high-definition films and photos. With the benefit of using Seagate's Momentus® Thin drive, the 9mm GoFlex® Slim ultra-portable hard drive breaks through these boundaries-delivering a beautiful, ultra-slim, lightweight storage solution to complement existing mobile computing devices so they can enjoy even more of the content they love, anywhere they want." "Consumers have a desire to have digital content available at their fingertips. However, in some cases, personal libraries of digital content are exceeding the storage capacity available in notebook PCs," said John Rydning, IDC's research director for hard disk drives. "USB attached HDD storage that is capacious, affordable, lightweight, and in a slim form factor will be appealing to many of these consumers." According to IDC, tablets, mini-laptops and netbooks are largely seen as secondary PC devices and are primarily used for information "grazing," or as vehicles of content consumption. Additionally, tablets, mini-notebooks and netbooks have very limited on-board storage requiring them to have access to additional storage, whether it is local attached, networked or from the cloud1. The GoFlex Slim and GoFlex Slim for Mac drives enable people to easily sync files between their computer and the drive, so that they can easily store, transport and enjoy hundreds of DVD-quality movies, hours of digital video, and multiple-thousands of photos or digital music while on-the-go.